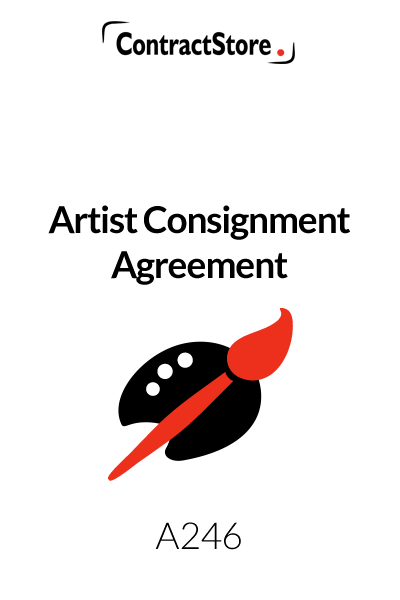 Who can use this Artist Consignment Agreement? 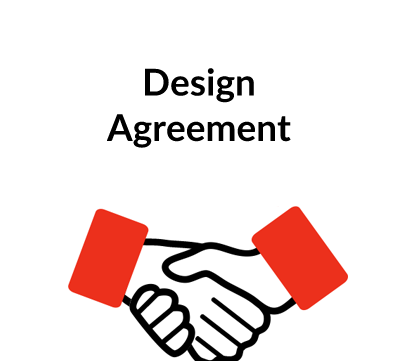 This template agreement has been developed by ContractStore in collaboration with Artquest (artquest.org.uk), part of University of the Arts London. It is easy to read and contains two pages of terms plus a Schedule which will list the works to be consigned and the retail prices. What is this Artist Agreement for? 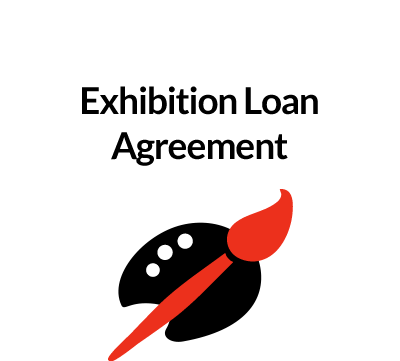 This Artist Consignment Agreement is for use by an Artist when agreeing with a Gallery that the Gallery will display and sell the Artist’s work. First. The practical issues which include the number of works, timing of the exhibition and pricing. If there are special production costs, the gallery may agree to pay for all or some of these. The same can apply to transport expenses and promotion: e.g. the gallery rather than the artist paying for an opening reception and brochures. The agreement needs to say when the artist will get paid, what commission the gallery will obtain and whether the gallery has any right to accept a lower price than the one on the catalogue. If so, you may want to specify a maximum discount. The artist will want the gallery to be responsible for safekeeping of all the artworks and to have adequate insurance cover in case of loss or damage. Copyright is another issue. As an artist you will want to retain copyright not only in the works but also in any reproductions. The gallery’s right to use pictures of the artist’s works should be set out in the agreement. 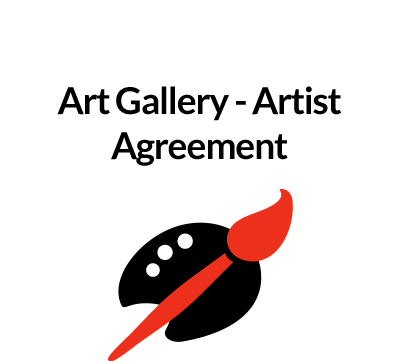 This agreement is for use by an Artist when agreeing with a Gallery that the Gallery will display and sell the Artist’s work. The agreement has been developed by ContractStore in collaboration with Artquest. It contains two pages of Terms and a Schedule which lists the works to be consigned and the retail prices. 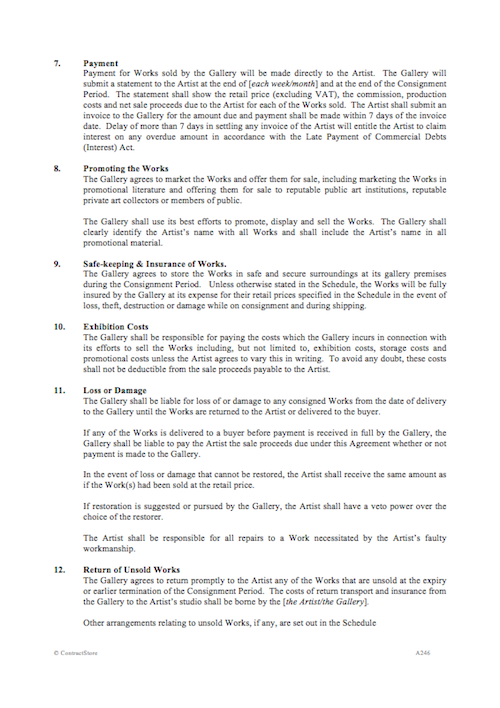 There are 16 short clauses which deal with the key issues which are Artist has to consider when arranging for the sale of works by a Gallery. A list of artworks is needed plus agreement on the period during which the works will be available at the Gallery. This could be for an exhibition or on a longer term basis. . The agreement will specify whether the Artist or Gallery is responsible for creating and delivering the works to the Gallery and, if the Gallery pays, whether it recovers those costs out of sale proceeds. This clause specifies the commission which the Gallery will receive from the sale of each of the works. The Gallery then has to account of the Artist for the net sale price after deducting its commission. Although it is unusual, a Gallery might agree to pay for some or all of the cost of producing the works, in which case this clause will apply and the details as to how the production costs will be recovered, if at all, will be set out in the schedule. Sometimes a buyer wants a discount and it can be in the interests of the Artist. However, in order to ensure that the Gallery does not agree too large a discount, our clause gives the Gallery discretion up to an agreed percentage – say 20% of the asking price – but on the basis that the discount is shared between the Gallery and the Artist. If the Gallery sells with a bigger discount, then the Gallery does not deduct that extra discount from the amount payable to the Artist. The Gallery will pay the Artist for all works that are sold. Our clause provides for the Gallery to send a statement to the Artist showing the retail price of each works sold, the commission and the amount due to the Artist. The Artist then has to submit an invoice to the Gallery who will pay within a specified period – 7 days in our form. Late payment will entitle the Artist to claim interest at the statutory rate which is 8% above base rate. The Gallery agrees to promote the Artist’s works including preparing promotional literature etc. The Artist’s name will be identified in all promotional material. Unless otherwise agreed, the Gallery will be responsible for insuring the works at their full retail price in case of loss or damage. The Gallery is also responsible for paying all exhibition costs which will usually include a preview. The Gallery is liable during the consignment period for any loss or damage. Also, if the Gallery does not receive full payment before delivering any of the works to a buyer, the Gallery still has to pay the Artist even if the buyer does not pay the Gallery. In the case of work that is damaged and needs restoration, the Artist is given certain rights. But if a work needs repair because of faulty workmanship by the Artist, then the Artist is responsible. 12. Return of Unsold Works. The Gallery has to return unsold works at the end of the consignment period and the clause will say whether the Gallery or the Artist is responsible for the shipment and insurance. The Artist retains Copyright in the works and all reproduction rights. The clause allows for the contract to be extended as well is terminated by either party giving notice to the other. This clause is designed to protect the Artist’s entitlement to royalty on resale of any works under the Artist’s Resale Right Regulations 2006. English law governs the contract but if there is any dispute, mediation is proposed as a first step – this is a lot cheaper than court proceedings.